We Have a New Device Called EMsculpt and Here’s Why You Should Come Check it Out! Are you searching for a non-invasive body shaping therapy that will address your body’s fat AND muscle? If so, Fountain of Youth can help you out. Thanks to our new device known as EMsculpt, we are now able to offer a non-invasive procedure for people who want to minimize fat and build muscle thus sculpting their buttocks or abdomen. EMsculpt has been found to cause a 19% average fat reduction and a 16% average increase in muscle mass. These results have led to an average patient satisfaction of 96%. The EMsculpt procedure uses non-invasive High-Intensity Focused Electromagnetic, HIFEM®, technology to induce muscle contractions that are not achievable through voluntary contractions. By exposing your body to these supramaximal contractions, it causes your muscle tissue to adapt to the extreme condition. This causes your body to remodel its inner structure that results in muscle building and sculpting your body. EMsculpt has been set apart from other non-invasive procedures due to its ability to implode fat while simultaneously building muscle for more defined abs and glute muscles. No worries about feeling uncomfortable! The procedure feels like an intensive workout. While receiving EMsculpt, you can lay down and relax. EMsculpt is fit for EVERY body! Both men and women can see the results from the EMsculpt procedure and get on the path to more toned abdominals and glutes. This non-invasive procedure includes four, 30-minute sessions. Each session is scheduled 2-3 days apart. The team at Fountain of Youth will create a personalized treatment plan tailored to your goals. Due to the fact the EMsculpt procedure is non-invasive, it does not require any downtime or recovery time before or after the treatment. You can get back to life as usual following each session! Most patients can begin to feel results right after they receive treatment. Two to four weeks after your last treatment session you will begin to see positive results that continue to improve over several weeks. 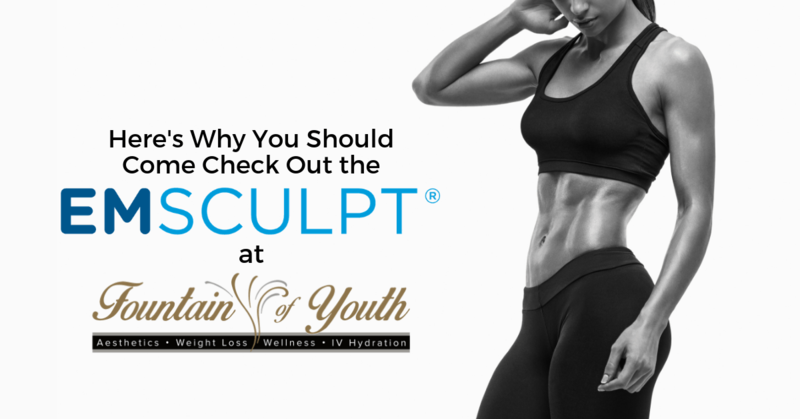 If you are interested in learning more about EMsculpt and how it may benefit you, contact our experienced team today! Visit us at 6729 Spanish Fort Blvd. Ste BC in Spanish Fort, Alabama, call us at (251) 525-8446, or visit www.foywellness.com now!